‘Phenomenology’ – Noun. An approach that concentrates on the study of consciousness and the objects of direct experience. Phenomenology and whisky. What, you may wonder, is the connection? We’d long been working on a blend of single malts that combines seemingly dissonant flavour profiles, but together creates something compelling. 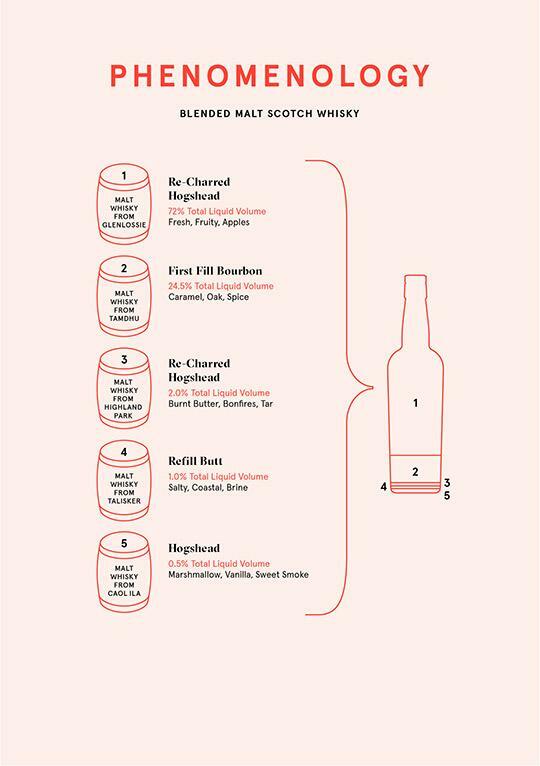 We landed on a recipe that elicited a surprising range of reactions and descriptions, each person taking away something different from the whisky. Rather than try to settle on whose perceptions were ‘right’ or ‘wrong’, we were inspired by the phenomenological school of thought to consider how different people experience the same phenomenon. Rather than referring to our tasting notes and description of the aromas and flavours of this whisky, we invite you to first experience it for yourself without preconception. Describe the ‘phenomena’ of this whisky yourself, in your own words and ideas. Your experience is your own, personal, subjective experience. Relish it. Looking for more information about this whisky? Get in touch below, ask us what you’d like to know about the whisky you’ve tasted and we’ll tell you.